In the United States, more than 600,000 patients are suffering from a vestibular condition called Meniere’s disease. What is it and is there any way to find natural relief? To learn more about Meniere’s disease, we are going to discuss the four main symptoms of this syndrome in detail. Then we will give patients hope that natural relief is available by considering two cases studies involving hundreds of patients over the past decade. Persistent, Recurring Bouts of Vertigo – Vertigo is a false sensation of movement that often has a rotational element to it. While vertigo is a very common symptom of a number of different conditions, it usually only lasts from a few seconds to a few minutes. With Meniere’s disease, vertigo episodes are more severe, lasting anywhere from 20 minutes to 24 hours. Sometimes vertigo strikes suddenly enough to cause drop attacks (falls caused by vertigo). A person may also experience nausea and vomiting if the vertigo is extreme and persistent enough. Tinnitus – Tinnitus is the technical term for a ringing, buzzing, or whistling sound in the ear. This is another symptom that most people experience from time to time. If you’ve ever attended a rock concert, you probably notice a ringing in your ear when you got home and tried to get to sleep. With Meniere’s disease, tinnitus becomes severe, especially as the condition progresses. One famous music artist who suffers from Meniere’s had to take a 2-year hiatus while trying to get the condition under control. To this day, he doesn’t allow flash photography during his concerts or interviews because he has discovered that this can trigger a Meniere’s flare-up for him. A Feeling of Fullness in the Ear – Meniere’s disease usually only affects one ear (although in rare cases or when the disease progresses, it can affect both). The way most patients can tell which ear is affected is that the ear will feel full when the condition flares up. This is because the inner ear fills up with fluid called endolymph. The fluid is supposed to be in the inner ear. However, with Meniere’s patients, it doesn’t seem to drain off properly via the eustachian tubes. This results in the clogged feeling and can contribute to vertigo and tinnitus as well. Partial Hearing Loss – This is another symptom that increases as the syndrome progresses. In the beginning, hearing loss may be intermittent. The first frequencies to go are the lower ones. Later in the disease, the higher tones begin to be lost. A hearing exam is an important part of both getting a diagnosis of Meniere’s as well as seeing how far along the condition is. Another reason that many Meniere’s patients end up with hearing loss is because of treatments such as dangerous surgeries or injections into the ear. These are usually justified by saying that the condition only affects one ear so you are only risking the loss of hearing in one ear to get rid of Meniere’s. However, some patients have undergone surgeries only to have Meniere’s set in later on in the other ear, so weigh the potential risks seriously. To show you that there really is hope for finding natural relief from vertigo, we would like to tell you about two extensive cases studies that have been completed. The first study involved 139 Meniere’s patients, all of whom were simultaneously suffering from an upper cervical misalignment. An upper cervical chiropractor diagnosed the misalignment and took a patient history revealing possible causes of undiagnosed whiplash in each patient. Gentle adjustments were applied to correct misalignments of the C1 and C2 vertebrae at the base of the skull. As a result, the average severity of vertigo for the patients decreased from 8.5 (out of 10) to just 3.0 after six weeks of care. Examinations and adjustments continued for two years with the average patient vertigo severity being reduced to a mere 1.4 out of 10. All but three patients experienced significant symptomatic relief, and those three patients had dropped out of the study six weeks in. The second study was even larger and involved 300 patients with Meniere’s disease over the course of six years of care under an upper cervical chiropractor. This study once again saw amazing success rates with 97% of patients experiencing significant benefits. In fact, the average relief from vertigo was a greater than 90% over the course of the six-year study. This helped to confirm the practitioner’s hypothesis that the upper cervical misalignment gradually creates a lesion on the eustachian tubes that contributes to the onset and symptoms of Meniere’s. 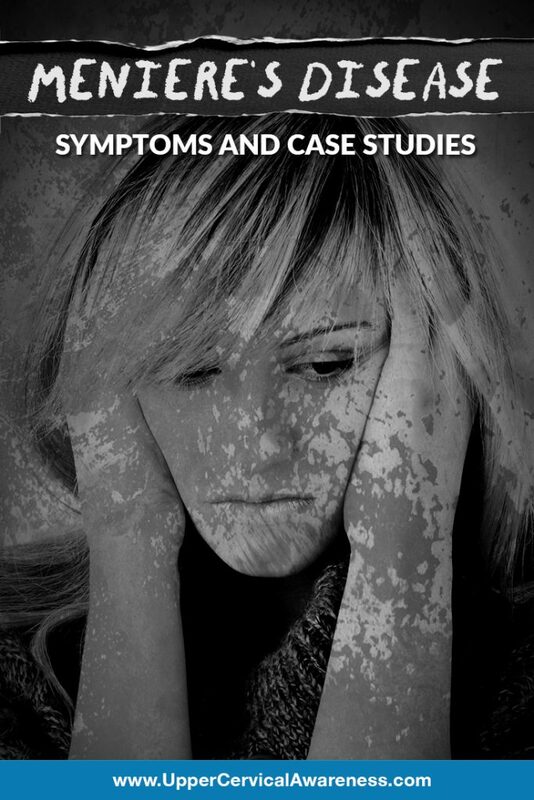 If you are suffering from Meniere’s disease and you were starting to give up hope that there was any way to find relief without risking permanent hearing damage, these case studies should give you a new direction to look. Upper cervical chiropractic has had success in helping Meniere’s patients to cope with this debilitating condition. To learn more, especially if you have a history of head or neck trauma, contact the nearest upper cervical practice. You may find that relieving an upper cervical misalignment provides you with all the respite you need.